Seeking catchy Typography Presets for your design project? 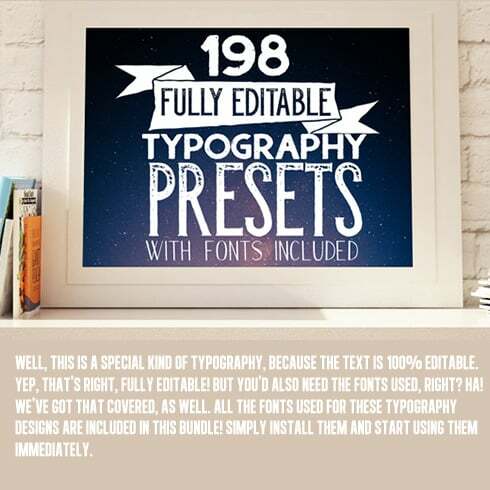 MasterBundles presents 198 fully editable typography presets with 47 fonts included into the package. All it takes is to install the fonts and presets into your default graphics suite, the rest is a matter of your creativity and experience! Indeed, designers use different software in their work. Whether it’s Adobe PhotoShop or Illustrator, these fonts and presets have you covered. What Are the Benefits of Using Typography Presets? Purchasing the typography designs from MasterBundles is extremely cost-effective! Offered at a discount, these files can be recycled numerous times for both business and personal projects. So, which benefits do you get together with the download package? Bonus: 5 premium fonts with special characters. Please note, the whole set of presets and fonts comes with an extended license. This means you are allowed to use these files for commercial purposes an unlimited number of times. Order Typography Presets to incorporate mind-blowing typography and lettering effects into your graphic designs! Bonus Files: 5 New Premium Fonts with Special Characters worth $95. What Are Fonts and What Makes Them Valuable? A web font is a range of symbols of a certain size and style that shapes one stylistic and structural system. The most crucial function of any web font is to attract the user’s interest with its shape and shade and get him to read the text. A great font can help to present not only the written information but even a particular feeling. Trendy and unique web fonts are more effective and more recognizable, so each business aims to actively work with its unique one as an important component of their brand identity. The cost of customized fonts typically can vary from $0 to $100 . Presently there are 5 major types of fonts. Serif fonts tend to be more typical, you can tell them via small lines placed on letters. Sans-Serif fonts are a modern font type, and characters do not have tiny “feet” . Slab-serif fonts look blocky and chunky, they add more substance to the overall design. Scripts imitate hand writing and also have interconnected letters. Stencils have round edges and narrow strokes, you might rely on them to develop a creative headline. What Are Product Bundles and What’s The Cost? Font bundle deals have become the staple deals for successful web designers. A bundle is a collection of a number of high-quality fonts. 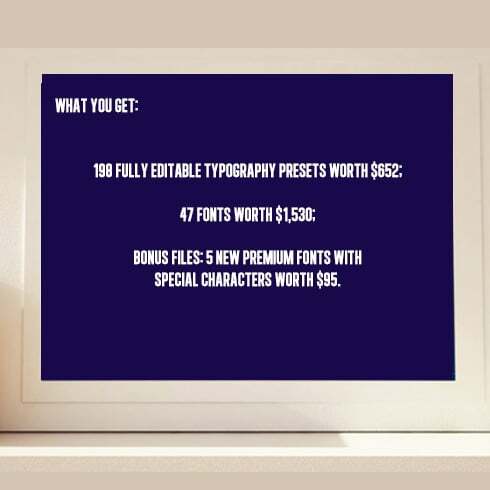 A font bundle will cost you way less than all of these fonts on their own. It allows saving up to a whopping 99%. At Masterbundles.com, there are plenty of font deals for $4- $50, primarily based on the size of the pack. How Do Web Fonts Impact Impression of the Product or Company? When considering creating banner ads, one should take the selection of web font really seriously. Promo banner creators should opt for those types of fonts that will correspond to the atmosphere of their advertisement. The web font itself does not only bring information in a textual form but also fills it emotionally, if one is applied correctly. As a rule, the promo text gives the audience an outline of the company’s product/service, which implies a properly-selected font will only help with the desired aesthetic impression. When the web font matches the content and is additionally paired well with the image, it will result in the prosperity of your commercial strategy. For that reason, one should not skimp on getting authentic and tasteful web fonts. I Have Not Found Any Suitable Web Fonts in This Bundle. What Should I Do? No worries ! MasterBundles.com offers lots of different bundle choices for different occasions and styles. Just check out our site and you’ll surely discover something to your taste and requirements. Any Alternative Bundles Do You Sell on MasterBundles? On top of font bundle deals, MasterBundles boasts numerous spectacular design bundles. Find out more about web theme bundle deals, image bundles, icons, textures, and patterns. There are as well electronic books and training courses, stock images, logo designs, illustrations and add-ons, mockups, as well as other categories. You’ll find thematic Xmas and Valentine’s deals, post cards and powerpoint templates. And also, obviously, our absolute favorite under $5 design bundles! Master Bundles is the very best place for getting web design products that will undoubtedly improve the way you work. We frequently have awesome discounts (approximately 99% off) on all products and web kits because we want to make them cost-effective for every person regardless of their funds. Having said that, you got to be attentive, because the discounts on most sets last for only five days. If you don’t want to miss out on the sales, just subscribe to Master Bundles newsletter and stay up-to-date with the latest arrivals and offered discount coupons. To discover the available coupons, go to this web page.